It all started from a mere curiosity of Korea and its complex but unfortunate history. 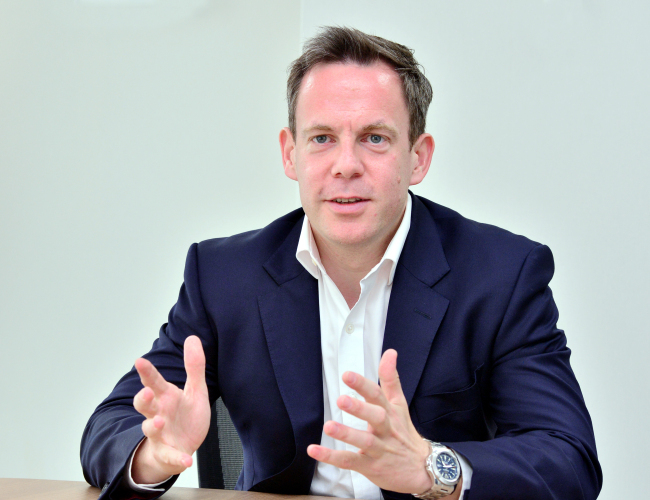 In the eyes of Sean Blakeley, CEO of the British Chamber of Commerce in Korea, the nation’s dynamic transition from a war-torn country to information technology powerhouse has always been a fascinating subject. The personal interest pushed him to learn more about diverse aspects of the country. But he couldn’t know that he would become a man bridging the two countries in terms of business and trade. “I found Korea is very unusual in politics and economics,” said Blakeley, as he sat down for an interview with The Korea Herald. “Politically, Korea is unique as it is in kind of the last Cold War situation and economically, it developed very fast although it was very poor after the Korean War,” he added. The English and history student at University of Leeds later came to Korea on a scholarship for a graduate school program at Seoul National University. He studied political science and diplomacy with a thesis on financial sanctions on North Korea. In 2015, he joined the British Chamber of Commerce, taking the charge of introducing the Korean market to British firms. And it has worked out. Since he joined the Chamber of Commerce, the staff has increased from one to 13, and membership has also increased around 30 percent each year to more than 200 member companies. 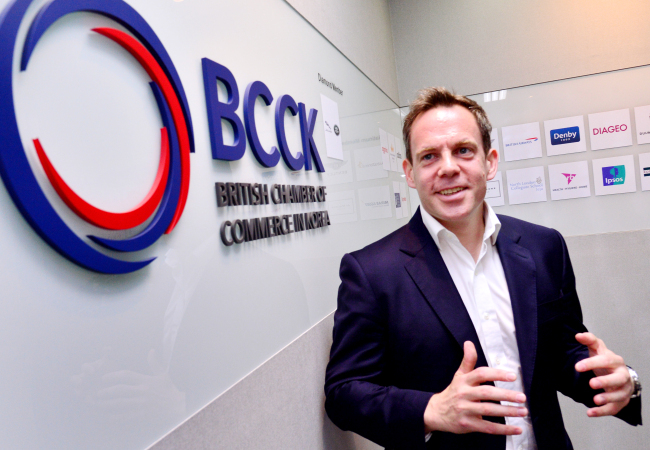 The main goal of the British Chamber of Commerce is to connect British companies hoping to advance into the Korea market with local companies in partnership with the British government, according to Blakeley. “The number of British companies hoping to jump into the Korean market has been on the rise, but many of them do not know how to,” he said. While in the Chamber of Commerce, he has connected some British companies, including the British upmarket department store Fortnum & Mason, to Korean counterparts. “Fortnum & Mason contacted us looking for Korean partners and we introduced it to Shinsegae. The British brand has been in the Korean department store since July of last year,” he said. He is not simply connecting the firms of the two nations. He is using his full understanding of Korean culture and fluent Korean language skills to narrow the cultural differences. For instance, UK companies usually require a longer time in their planning stages, considering and discussing every option with all players involved. In Korea, the planning stages are shorter and sometimes ignored when a leader instructs the staff to do something. Errors are fixed while working. Blakeley said trade between Korea and the UK is growing stronger with each passing year. The UK is the 14th-largest export market for Korea. The total trade value between the two countries has been on an upward trajectory since 2011. The sum was $8.7 billion in 2011, but the total trade value had expanded to $14 billion in 2017. The UK economy has a comparative advantage in health care and creative industries, such as interior design, architecture and the financial service sectors, according to Blakeley, and Korean companies in recent years are showing strong interest in collaborative opportunities in those areas. He cited examples of British designer David Collins Studio’s interior design work for Le Meridien Seoul and British health service provider Babylon Health’s partnership with Samsung. “When I first came to Korea a decade ago, Korea was very unfamiliar to many British people. But now, interest in Korea has been growing in the UK centering on its beauty products, fashion and K-pop,” he said. Behind the growing popularity, the rise of Koreans traveling to the UK, Korea’s trendsetting roles in beauty and fashion and Korean singer Psy’s “Gangnam Style” all played roles, according to the CEO. “Actually, British and Koreans are also quite good matched in personality.” Both of them are a little bit conservative and try to look classic outside, but they have strong colors and characters inside, he said. “Korea is very fast moving and there are many chances to do something here. Our organization also grew a lot within a short time, which cannot be done in the UK where the speed of culture and business is slower,” he said.